Peter Lamprey starts with some friendly banter and comments that weather has curtailed flying. He notes that there are now many Australians and Canadians on base. He goes on to say he was glad that the rumour of a bomb hitting his previous place of employment was not true and concludes wishing all well. remuster to some other damned trade. As for “Spud” it is suprising [sic] that he should still be anywhere near motors, seeing that he joined as an M.T. driver. I have never – at least hardly ever – tried to agitate the urea with Bro. George as you are so fond of accusing. If I feel like giving three cheers for the old war-horse now and again, who are you to try and get me to abuse him? Seeing that he and I have manhandled two wars alone it is about time someone else borrowed his bow and arrows and did a bit of helping Uncle Joe out. Allah. Still I suppose they will eventually drag me screaming into a kite and make me fly again. This bird man business is all right until some dumb cluck takes the ground away from underneath you, and then you wish you had joined the Salvation Army. I like the posters about the brave air-crew – they must be advertising the Luftwaffe. The bravest deed last week was asking for twenty Players in a stange [sic] pub. [underlined] 4. [/underlined] the Berlin pubs there would be no need for eight thousand pounders. They can wreck a pub quicker than a land mine after about six drinks. The station is full of Aussies and Canucks and believe you me, they are as tough as Herr Rommel’s mark VI tanks, with slightly less finesse. The authorities have been clamping down on us lately owing to some slight bother with the Staffordshire Constabulary. That – we understand – is the reason for being under stand-by orders for more than three days at a stretch. If they don’t lift the order by next pay-day I am afraid the boys will carry the camp into town bit by bit and then fetch the town back to play with in their billets. I heard – from a very roundabout source – that Waterlows had received a little present from our opposite numbers. However your letter shows that it was, fortuneately, [sic] only a rumour. Still they were near enough, no doubt, to cause a major attack of ring quivers in the fire watching department. If you people want us to unload excretus [sic] over there, you are bound to get a splash back now and then just to show we haven’t quite beaten the last brick into the deck yet. far flung regions where they will be made to work. From what I remember, this would cause a severe attack of heart failure in anyone bar Sam ie. [sic] Deputy F.O.C. P.S. I hear the land army are striking for longer tools and shorter periods. 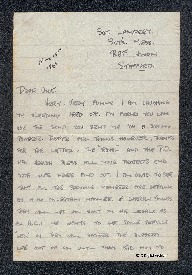 Peter Lamprey, “Letter from Peter Lamprey to W Gunton,” IBCC Digital Archive, accessed April 20, 2019, https://ibccdigitalarchive.lincoln.ac.uk/omeka/collections/document/6612.